Born in 1972 in the old county of Westmorland, Graeme was brought up in Kirkby Lonsdale. Drawing from an early age he studied art all the way to 'A' Level at Queen Elizabeth School, Kirkby Lonsdale. From there he went on to specialise in graphic design at Cumbria College of Art and Design in Carlisle. Graeme's other great interest at school was running and as a 16 year old was county champion at 1500m. Graeme now lives and works in Lancaster and takes much of his inspiration from this historic city. 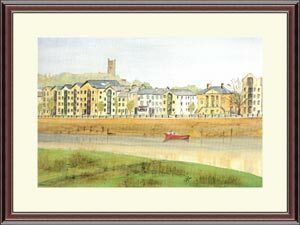 From one of his watercolours of St. George's Quay, Studio Arts have published his first open edition print. As well as producing paintings of Lancaster he paints many pictures of the Lake District fells. Racing on the fells for Kendal Athletics Club in all weathers provides the clearest picture of how beautiful yet dangerous this area of England can be. Graeme's style of painting is in the traditional watercolour style favoured by many artists over the years, but he is also currently experimenting with mixing acrylics in impasto style on top of some delicate watercolour backgrounds.